One of the key benefits of virtualization is the ease of migrating virtual machines (VMs) from one host to another. The task of migration becomes more difficult, however, when you are migrating from a hypervisor of one platform to a hypervisor of another platform. For example, you may need to migrate a VM from Hyper-V Server to VMware ESXi. Today’s blog post explains the use cases of cross-platform VM migration, how this task can be carried out, and how NAKIVO Backup & Replication can help you achieve this with the new Cross-Platform Recovery feature. The post also contains a detailed walkthrough of how to configure NAKIVO Backup & Replication and your virtual environment for performing cross-platform recovery. Cross-Platform Recovery is a new feature included in NAKIVO Backup & Replication v7.5. The feature lets you export virtual disks from VM backups to different formats for further manual recovery of the virtual machines in different environments. This backup export feature can be useful if one hypervisor goes down and you must recover the VM on another hypervisor that belongs to another platform. Let’s explore the use cases in detail. When Can Cross-Platform Recovery Be Used? Migration from one platform to another. You can export virtual disks from a Hyper-V VM backup, then import the virtual disk to a virtual machine running on a VMware ESXi host (and vice versa). In a multi-hypervisor environment, you may need to migrate a VM from Hyper-V to a VMware environment or vice versa. There are a number of possible reasons for this. For example, you might decide to run Linux VMs on the VMware platform while keeping all your Windows VMs in a Hyper-V environment. You can also export a virtual disk from a backup of a VMware VM that was running on an ESXi host and import that VM disk to a VM running on VMware Workstation. This approach can be useful for users who need the VM on their PCs or laptops for portability reasons – e.g., for remote work or on a business trip, when connecting to a VM running on an ESXi host at the company’s office could be difficult or inconvenient. With Cross-Platform Recovery, you can even run a backed-up Hyper-V VM on Oracle VirtualBox. Converting VM virtual disks for long-term archival (independent of backup software). You can export virtual disks from VM backups and keep them in archives (in the native VM disk format for the appropriate platform). The advantage of this approach is the ability to recover a VM after years, even if you no longer have a working instance of your backup software in your environment. (NAKIVO Backup & Replication stores VM backups in your backup repositories using a proprietary format). Recoverability testing. Testing is an important part of disaster recovery preparation. Every disaster recovery (DR) plan must be tested thoroughly before implementation. With Cross-Platform Recovery, you can test which virtual machines can be migrated successfully from one virtual environment to another. You can then use the results to compose a recovery scenario for your DR plan. Suppose you have a Hyper-V host and a VMware host. Suddenly, the Hyper-V host goes down (due to a virus attack, for instance). You have a backup of the VMs (created by NAKIVO Backup & Replication) that were running on the Hyper-V host. You have previously tested the recoverability of those VMs on VMware ESXi hosts and created a DR plan encompassing the various recovery scenarios. Thus, you know which Hyper-V VMs can be successfully recovered with backup export and run on the ESXi host. As a result, you can recover these VMs right away, without losing time. How Does Cross-Platform Recovery Work in NAKIVO Backup & Replication? First, you select a backup of a VMware or Hyper-V VM. You then define to which format the virtual disks should be exported and select a destination location for the exported files. VMDK – a virtual disk for a VMware virtual machine. This virtual disk format can be used for a VM running on an ESXi host or on VMware Workstation. VirtualBox also uses the VMDK format for VM disks. 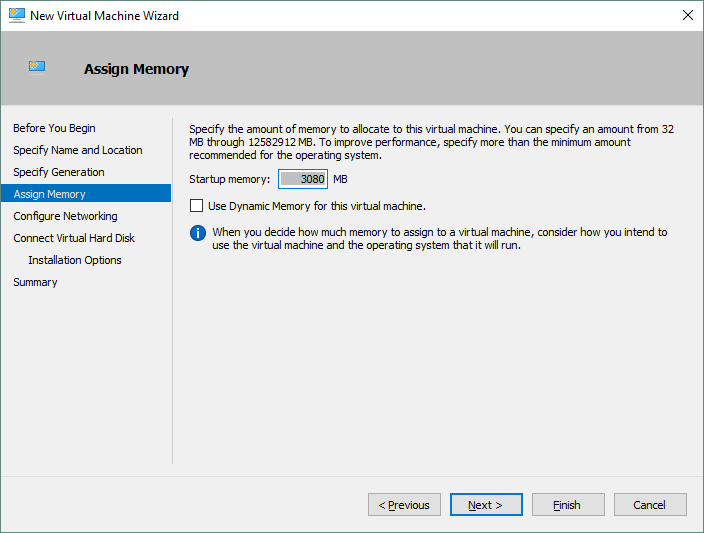 VHD – an older format of virtual disks for Hyper-V VMs. 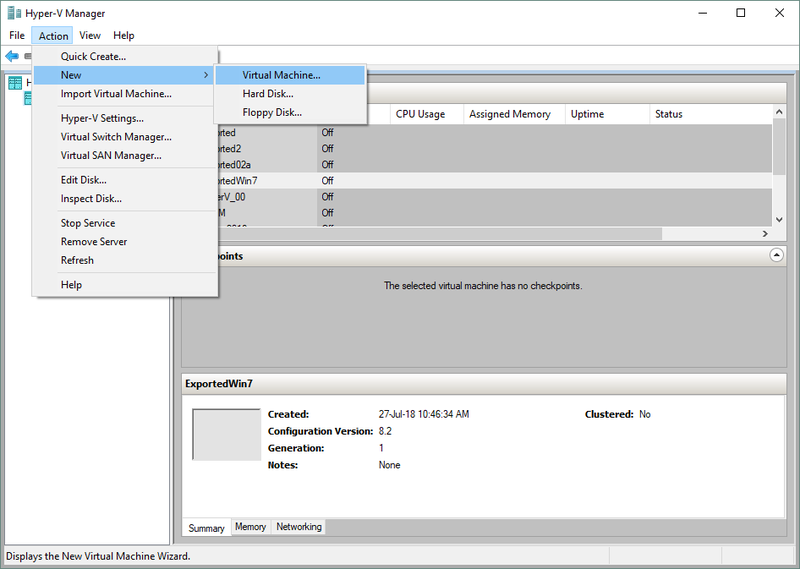 VHDX – the newer format of virtual disks for Hyper-V VMs. Note: If the original (source) VM for the backup used a VHDX virtual disk, converting to VHD may cause issues because of the limitations of the older format (e.g., the maximum disk size of 2 TB). Microsoft introduced the VHDX format of virtual disks with Windows Server 2012, along with Generation 2 Hyper-V VMs. Local folder on the assigned Transporter. NAKIVO Backup & Replication consists of two main components: a Director and one or more Transporters. If only the onboard Transporter is used, then the virtual disks would be exported to a specified directory (as chosen by the user) of the machine on which the instance of NAKIVO Backup & Replication is running. CIFS (SMB) share. The Server Message Block share is popular in Windows environments. NFS share. The Network File System share is popular in Linux environments. You should enter the path and credentials (username/password) used for accessing a shared resource. Don’t forget to provide enough disk space at the destination location for export. Let’s explore how to use backup export with a walkthrough. Suppose you have a backup of a VMware VM with Windows Server 2016 installed as a guest OS (operating system). You want to export the virtual disk to VHDX format for further recovery of this VM in a Hyper-V virtual environment. Open your browser and navigate to the web interface of NAKIVO Backup & Replication. In order to configure Cross-Platform Recovery, click Recover > Export backups. The Backup Export Wizard is launched. In the left panel, select a VM backup from which you want to export virtual disks. In this example, the name of the VM backup is WinServer2016. In the right panel, you can then select a recovery point. The latest recovery point is used by default. Click Next to proceed. Now, select the virtual disks to be exported by ticking the appropriate checkboxes. A VM can use multiple virtual disks; you can export all the virtual disks or select only some of them. The VM considered in this walkthrough example has only one virtual disk. Once you have selected the virtual disks for export, click Next. At this stage, you choose the export options, such as export format and location. You should input the path to the share as well as the username and the password for access (see the screenshot below). Click Manage credentials if you want to use previously saved credentials. Click the Test Connection button to check whether NAKIVO Backup & Replication can access the shared location you have chosen. Make sure that there is enough free space at your export location. When you are ready to export the virtual disks from the backup, click the Export button. Backup export has been initiated. Wait for the export process to complete. You can view your running Backup Export job along with the statuses of other jobs in the Activities tab. The job status would change from “Running” to “Completed” when it is finished. When the Backup Export job is complete, you can see the VHDX virtual disk file in the shared directory that you specified during configuration. The name of the exported file contains the date and time at which the backup of the VM was created. You can now attach the virtual disk to a Hyper-V virtual machine. The virtual disk can be attached to either an existing VM or a new VM. The virtual disk that was exported in this example contains a partition with the operating system. The creation of a new VM is performed as follows. 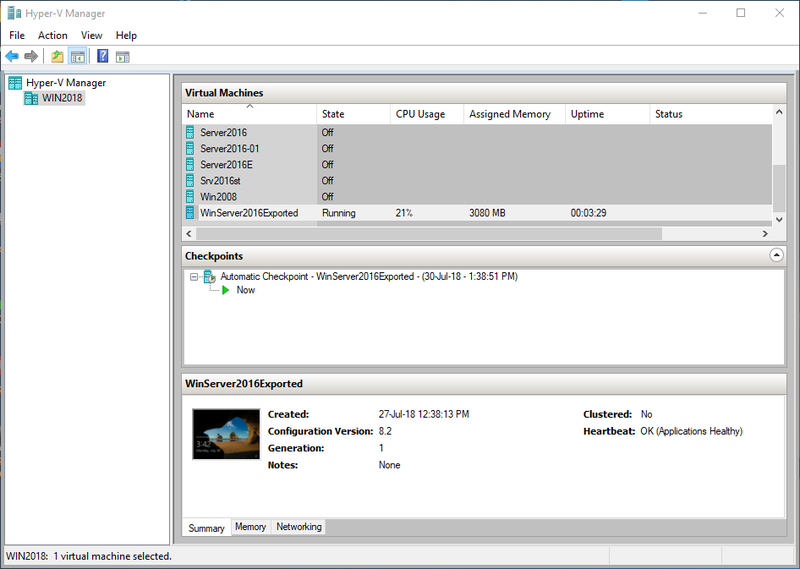 Open Hyper-V Manager and click Action > New > Virtual Machine. Specify the name and location for the new VM. In this case, the VM name is WinServer2016Exported and the location is “D:\Virtual\Hyper-V\BackupExport\WinServer2016exported” (the virtual disk is already copied to this directory). 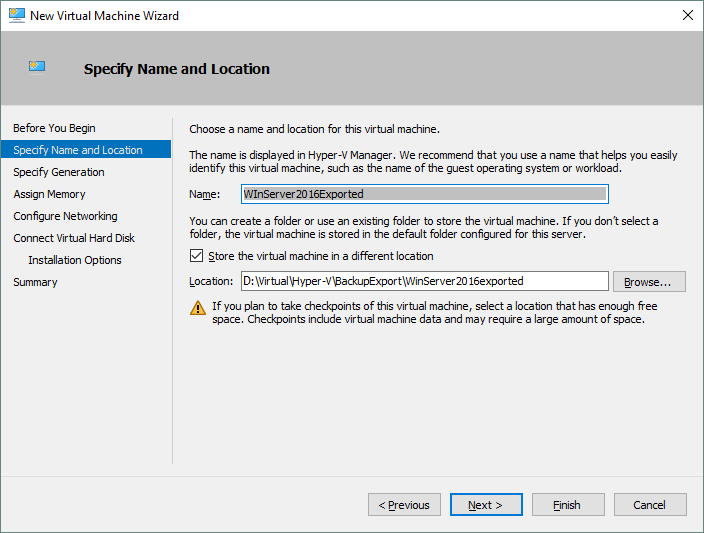 Tick the Store the virtual machine in a different location checkbox before specifying the location. Click Next to proceed. 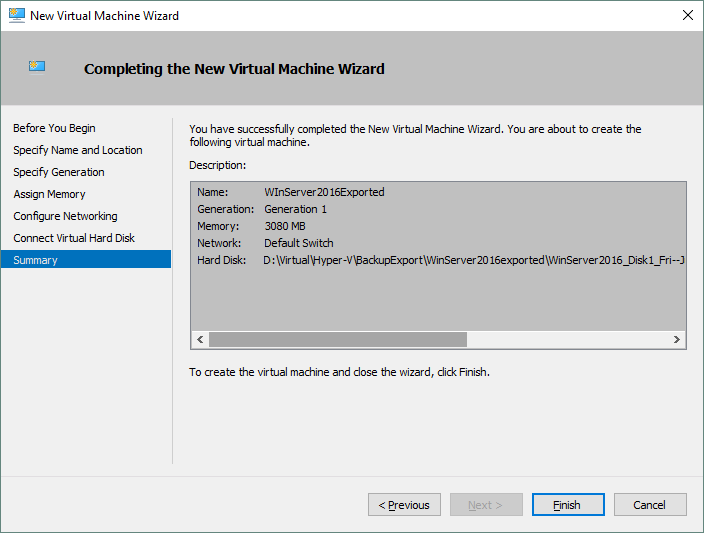 Specify the generation for the new VM. There are two generations of Hyper-V VMs: Generation 1 and Generation 2. Generation 1 VMs have higher compatibility than Generation 2 VMs. In this walkthrough example, Generation 1 is selected. When you have chosen a generation, click Next. You are now at the Assign Memory stage. You can set the same amount of memory as was allocated for the VM when it was running on its previous host (the host that was used before backup and export of virtual disk), as in this example, or choose a different amount. Click Next. The next step is Configure Networking. Select the appropriate virtual switch for the VM’s network connection, then click Next. “D:\Virtual\Hyper-V\BackupExport\WinServer2016exported\WinServer2016_Disk1_Fri--Jul-27-2018-at-8-42-15-AM-(UTC-+00-00).vhdx” for the purposes of this walkthrough example. Check the summary and click Finish if everything is suitable. Now that you have a new VM with an exported virtual disk attached, you can run the VM. Open Hyper-V Manager, right-click the VM you just created, and in the context menu, click the Start option. The virtual machine is running; the OS has been loaded successfully. You can now connect to the VM. As you can see, the backed-up VMware VM with Windows Server 2016 that was running on an ESXi host is now running on a Hyper-V host thanks to the new Cross-Platform Recovery feature included in NAKIVO Backup & Replication 7.5. Note: If the guest OS is older than Windows Server 2016, you may need to install Hyper-V Integration Service. The next blog post will explore how to run a Hyper-V VM on a VMware ESXi host after backup export. Today’s blog post has covered the new Cross-Platform Recovery feature that was released with NAKIVO Backup & Replication 7.5, including a discussion of how the feature works and in what cases it can be used. Cross-Platform Recovery provides you greater flexibility, allowing you to recover VMs from backups created with NAKIVO Backup & Replication even if the source and destination platforms differ. This feature can be used for long-term archival, VM migration from one platform to another, and testing purposes. Don’t forget to test the recoverability of your VMs with Cross-Platform Recovery when you compose your disaster recovery plan and business continuity plan. In this blog post, you have seen how to configure backup export in NAKIVO Backup & Replication for recovery of a VMware VM on a Hyper-V host. The walkthrough included instructions for configuring the Hyper-V host to successfully run the VM with the exported virtual disk. The next blog post follows from this one, discussing configuration of your virtual environment for VM recovery from Hyper-V backup to VMware ESXi host with Cross-Platform Recovery. A third post will explore configuration of the virtual environment for VM recovery on VMware Workstation and VirtualBox using VMDK files of a virtual disk exported by NAKIVO Backup & Replication from a Hyper-V backup.